As I have already described what are Arrays and their basic creation C code, in this post, we'll learn how to perform Binary Search In An Array, its Algorithm And C Code. In computer science, a binary search or half-interval search algorithm finds the position of a specified value (the input "key") within a sorted array. In each step, the algorithm compares the input key value with the key value of the middle element of the array. If the keys match, then a matching element has been found so its index, or position, is returned. Otherwise, if the sought key is less than the middle element's key, then the algorithm repeats its action on the sub-array to the left of the middle element or, if the input key is greater, on the sub-array to the right. If the remaining array to be searched is reduced to zero, then the key cannot be found in the array and a special "Not found" indication is returned. A straightforward implementation of binary search is recursive. The initial call uses the indices of the entire array to be searched. The procedure then calculates an index midway between the two indices, determines which of the two subarrays to search, and then does a recursive call to search that subarray. Each of the calls is tail recursive, so a compiler need not make a new stack frame for each call. The variables imin and imax are the lowest and highest inclusive indices that are searched. It is invoked with initial imin and imax values of 0 and N-1 for a zero based array. The number type "int" shown in the code has an influence on how the midpoint calculation can be implemented correctly. With unlimited numbers, the midpoint can be calculated as "(imin + imax) / 2"
This Code Is Quite Easy. First we take the no. of elements from the user and then user enter them. Then user inputs the element that has to be searched. Then we begin the searching. 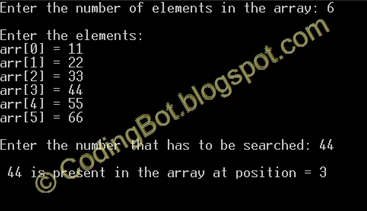 If the element to be found is the middle element, the element is shown, other wise for the two conditions, arr[mid] > num or arr[mid] < num, the search iterates, either till the element is found or until the array gets terminated.